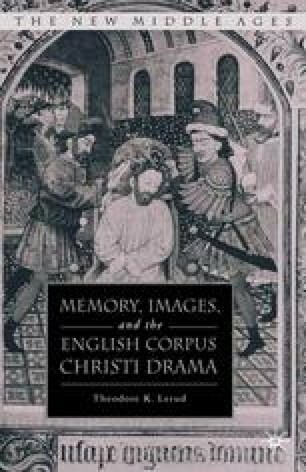 In this chapter, we shall step back from discursive treatments of images and their proper function to look at two manifestations of image-making—one a precedent for and the other an analogue to the Corpus Christi drama. From its earliest forms in the Mass, the liturgy was regarded as a memorial to Christ’s life, and the tropes and ceremonies to which it gave rise contain clear evidence of attention to matters of context and place. At the same time, the developing visual art of manuscript illumination, particularly the illumination of Books of Hours largely contemporary with the Corpus Christi plays, reveals a sensitivity on several levels to space, border, and background, which suggests parallels to the drama.